All about a boy works I am partial to boy collections. 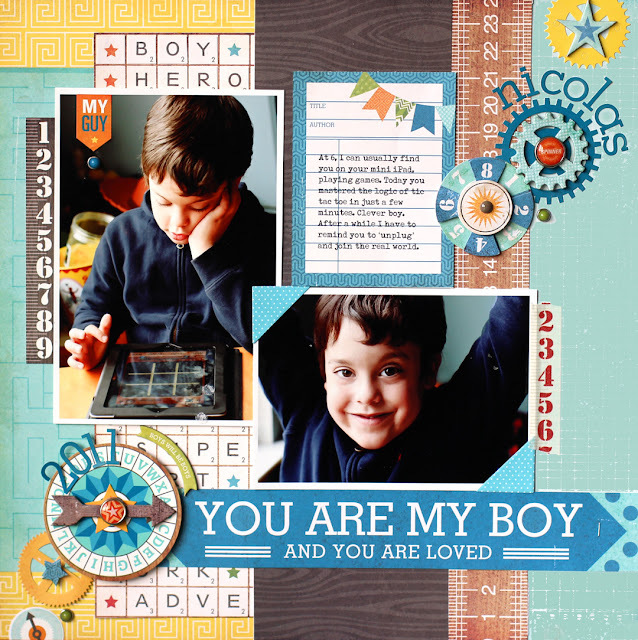 Not just because I'm a boy mom, but because I love the shades of blue and orange and yellow that are typically used. This new collection by Echo Park is no exception. Add in some really fun spinners, number wheels and cogs and you have a really versatile collection. These photos of Nico learning the logic of tic tac toe remind me so much of me at his age. I loved logic games. And I especially loved learning how to beat them. I used pencil and paper, while he uses an iPad - gotta love the technology. The spinners and cogs in the line tied in the logic and fun of playing games. They were perfect for the theme of the photos. To create the spinner I layered chipboard, stickers, a brad and some foam pop dots for dimension. Aww Those pics are cute and go so well with the scoot Collection. Congratulations! I will contact you very soon on how to collect your prize. Thanks so much for hopping along. It's the March 2Peas Hop! I love these little blurbs of a hop. More photos, less words is a good thing. So here we go, let's hop 2Peas style. 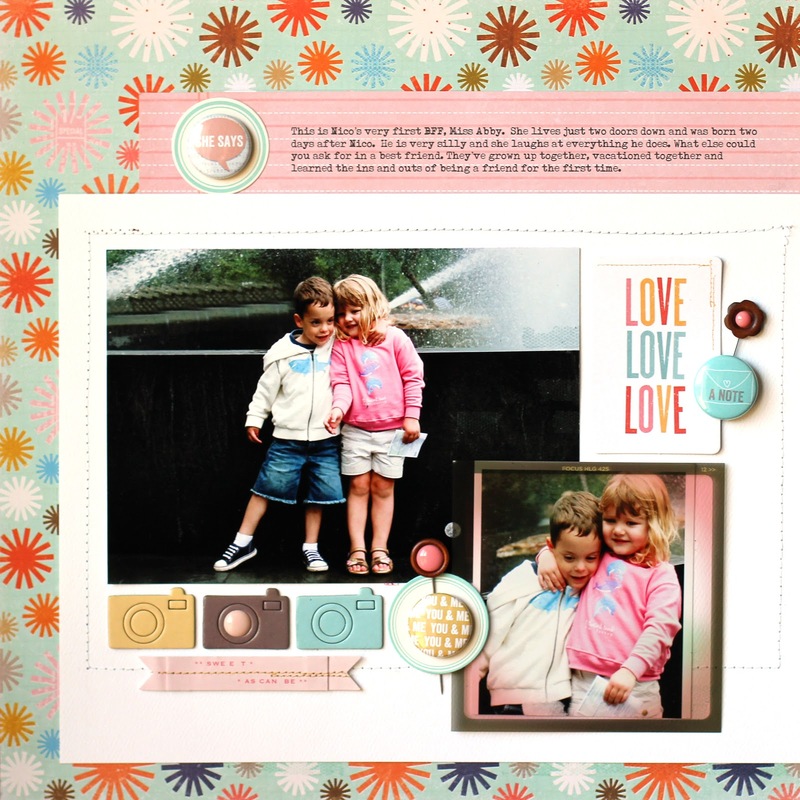 This is a peek of a very colorful page I made for the April Garden reveal. Can you guess our theme this month? Look for it in the Garden Girls Gallery on the first of the month. This beautiful layout is by Melinda Spinks. I love how incredibly creative the hearts made of slips of paper is. I want to try this technique on all kinds of shapes. You can see more of Melinda's work in her Gallery at 2Peas. She's one of my favorite designers. Just of the few of things I'm using on layouts right now. 1. Snippets Collection by Studio Calico. Bright + bold colors, great graphics. 2. Jewels Rhinestones from Glitz Design. Love the nautical theme and large size. 3. 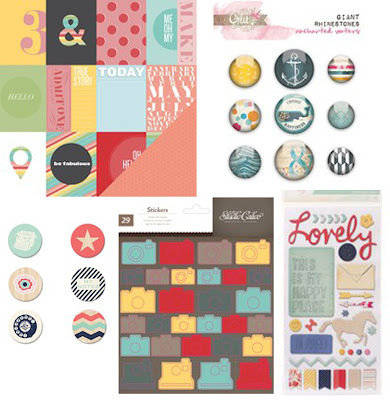 Flair from the Trendsetter Collection by Fancy Pants. Perfect combo of salmon + navy. 4. Chipboard camera from Studio Calico. 5. 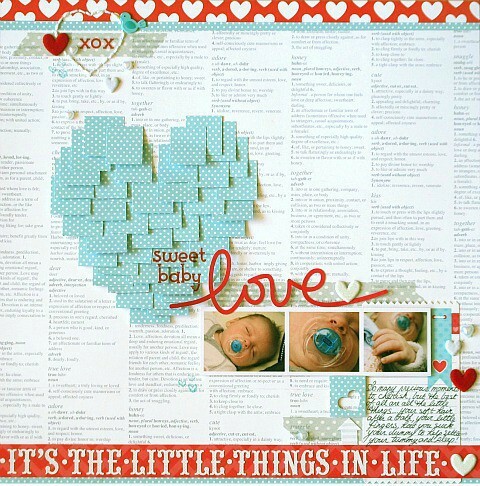 Chipboard stickers from the Lucky Charm collection by American Crafts. And now for a giveaway. Leave a comment and tell me what you current favorite collection is. Don't forget your PeaName too! You'll be entered to win a $10 gift certificate to twopeasinabucket.com. The winner will be announced one week from today. Thanks for playing along! Now hop on over to see what Garden Girl Marcy Penner has going on. And if you've missed a step, go back to GG Jana Werner or the Two Peas Blog. This weekend we spent some time by the shore in Atlantic City. 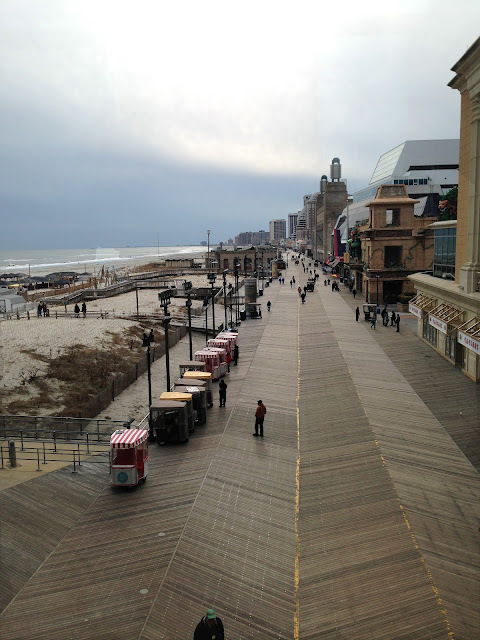 It was chilly, but there is nothing like walking the boardwalk and smelling that sea air. It was a weekend for us to be a couple, gamble some, dance a little, laugh a lot and spend time together. 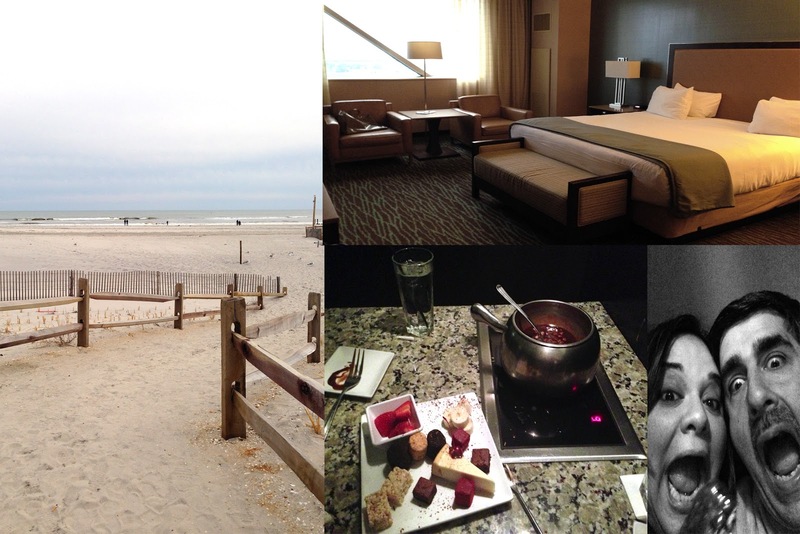 I love weekend getaways like this. The little guy spent some quality time with his grandparents. I think he might've been spoiled a bit more than we were. Although on the ride home, he did say 'it's good to have our family back together again." Love that boy. We celebrated 100 days of school a few weeks ago. The assignment - decorate a shirt with exactly 100 items. He insisted we go to Michael's. He picked out the foam shapes. Chose a matching shirt himself. And then insisted on laying out the entire design on his own. He likes to make stuff. Wants to do it all on his own with no suggestions from the Mom peanut gallery. He told me 'Mom, I have this' a dozen times. I stepped away and he did his thing. I think he did good, that little crafty boy of mine. Every 4 weeks I dig into my stash and pull out something I've been sitting on for a while. You know those embellishments that keep piling up or that collection pack that gets buried under the new stuff. It's a challenge coming up with new ways to use things up. I'm much better at hoarding them. That's why having a video assignment like this is good for me. It forces me to think out of the box (I try to anyway) and I make a dent in my collection. My stash of flair was up this week. And then a few of the other examples I worked on. This first one is a 'border of flair'. What I love most about it is the Lucky Charm collection with it's bold red and navy colors and beautiful patterns. You'd think the collection is more on the feminine side, but I've been using it a lot for layouts about Nico. These are photos + stories about the first time he visited the Hershey Chocolate Factory in Pennsylvania. His little chocoholic self was loving it! 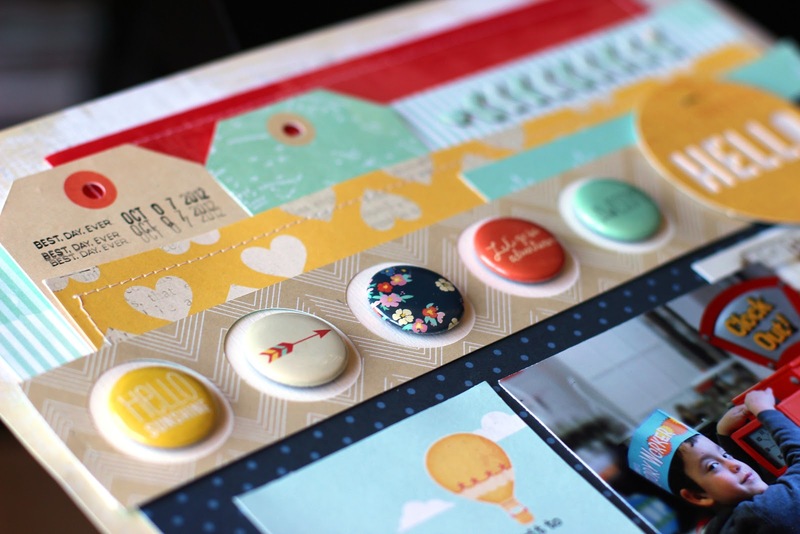 This next layout shows a cluster of flair, leading the eye around the page. The photos are old. Nico was right around four here and that was his cute BFF Abby. They were very sweet together and I'm glad I got this memory down in his book. Still working on doing more videos for the blog. I enjoy it, just wish I had more time! Do you ever have those moments when you look at a photo and it brings you back to the exact moment you took it? I have a crystal clear memory of taking these 4 years ago. We were in Disneyworld, sitting on Main Street watching a parade. I was busy taking pictures of the parade, when I turned and looked at Nico. He had flipped his Mickey shades over his eyes and was sitting back in his stroller paying close attention to every float that went by. He was tired and it was hot, but he was totally relaxed. I remember smiling at him really big, just being grateful for him and being happy. 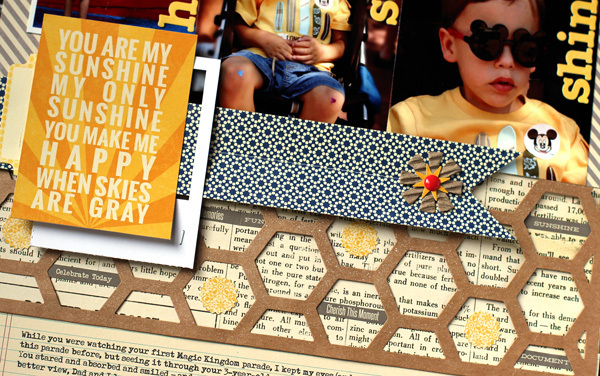 I wanted the layout to convey 'happy' and what better way to do it than with a dose of bright + sunny yellow. The title card provides some journaling and a pop of color. 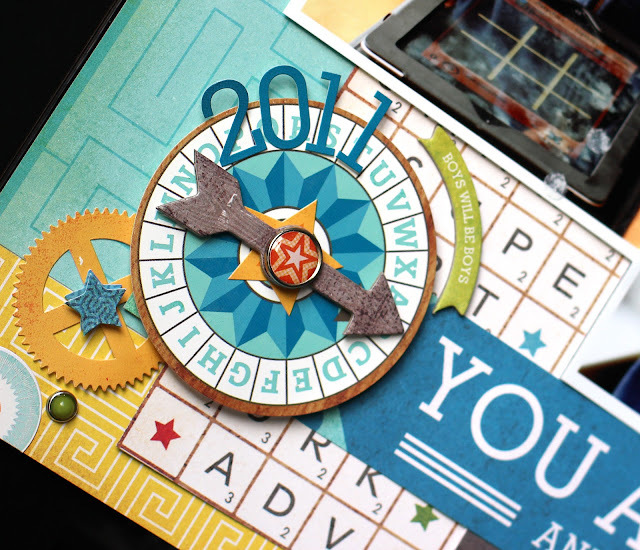 The hexagon paper is precut and should be coming soon from Jillibean. It was a quick and easy was to add texture and shape to the layout. I filled some of the spots with word strips and sun punch outs to emphasize the theme. Most of the papers here are from upcoming Jillibean lines (Chilled Cucumber Soup and Fresh Vegetable) that should be available in March. The play on words in the title add a little whimsy and fills up dead space in the photos. These are some cards that I did for Jillibean's booth at CHA this year. Sorry about the poor photos. Somehow I forgot to take pictures with my camera. These were shot with my iPad at the last minute. You can see some of my messy trays in the background there. All of these cards were created with Jillibean's brand new lines (Cucumber Soup, Fresh Vegetable and Irish Farmhouse) coming to 2Peas soon!